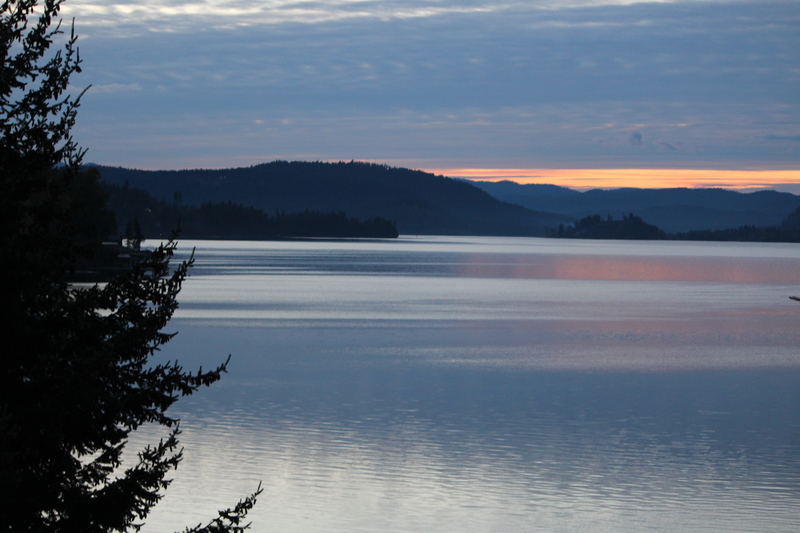 Stunning sunsets from the Lodge at Sandpoint | Oh, the Places We See . . .
Our trek through the Inland Northwest took us from Spokane, Washington, up Highway 2 through Green Bluff, an area boasting over 30 apple orchards and numerous at-home entrepreneurs. From there, we drove north toward Bonners Ferry, Idaho, but only made it to Sandpoint when near-darkness and weariness overtook us. Had we known that Sandpoint would become one of the classiest, most interesting cities on our trip, we would have planned it as a destination. As it was, we sat in the car looking on our iPhones for the names of B&B’s, hotels, restaurants, etc. 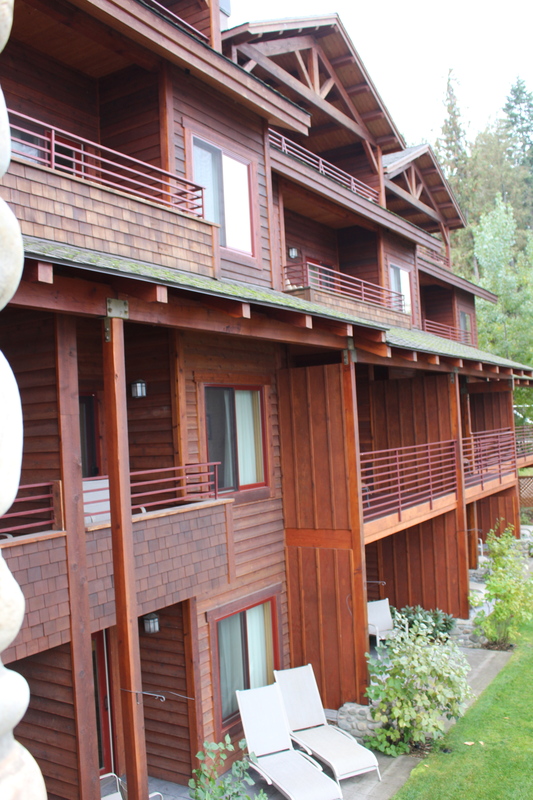 What a find we made when we booked unknowingly one of the finest places we stayed on the whole trip: the Lodge at Sandpoint! 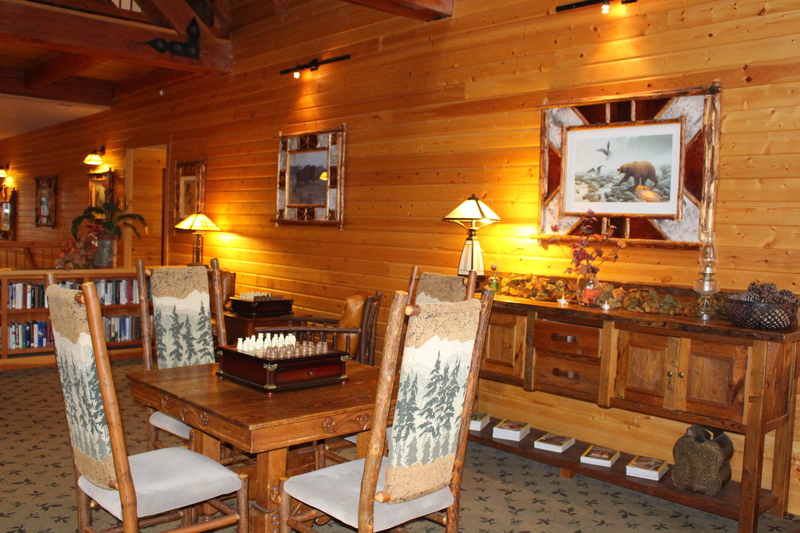 Situated on Lake Pend Oreille, this Old World boutique hotel with modern conveniences charmed us with log construction and upscale lodge furniture. We could see why the website for The Lodge states that it’s “built on the proposition that Life at the lake is the most fun of all”! No wonder it’s a destination for small weddings, family gatherings, and weekends away for folks like us. 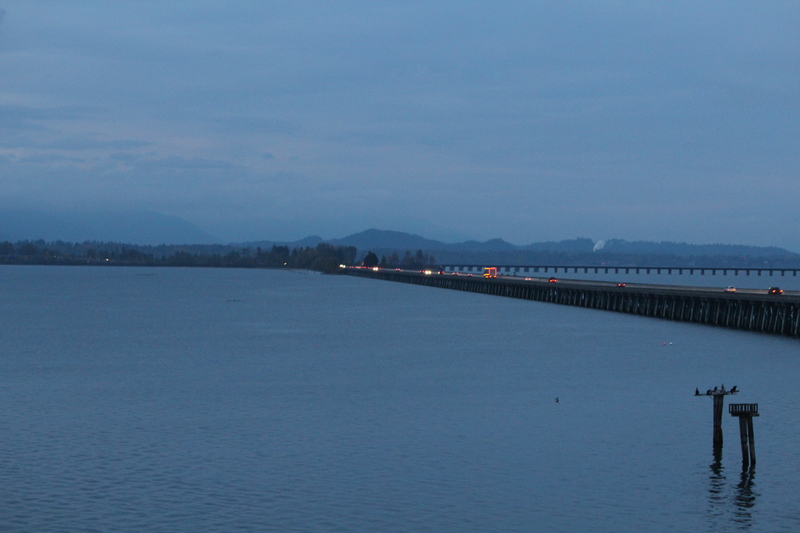 We wondered how long it would take to drive from Sandpoint city center to The Lodge, but the drive was short: about two miles across the Long Bridge into Slagle. We never had to leave The Lodge for dinner since Forty-One South (on the premises) offers gourmet cuisine in a lovely waterfront setting. Our room was spacious even though we were only there for sleeping. 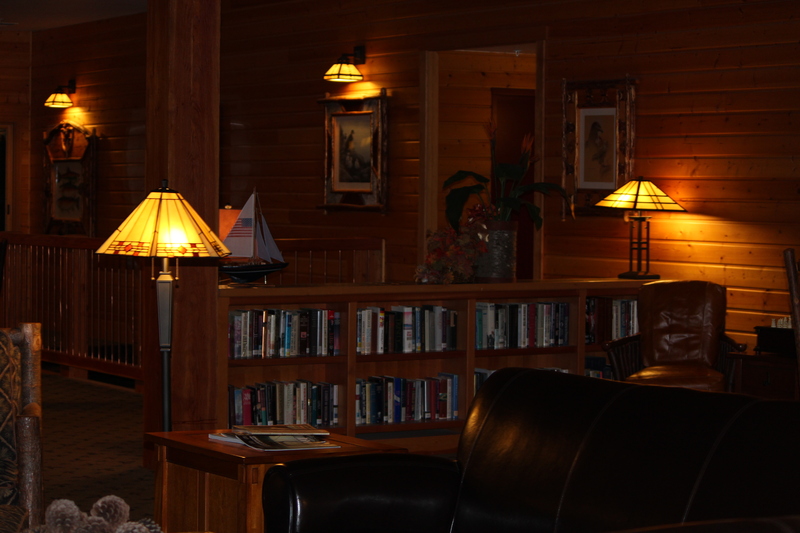 We mostly enjoyed spending time reading in the main lobby or wandering the more than 600 feet of sand beach outside. 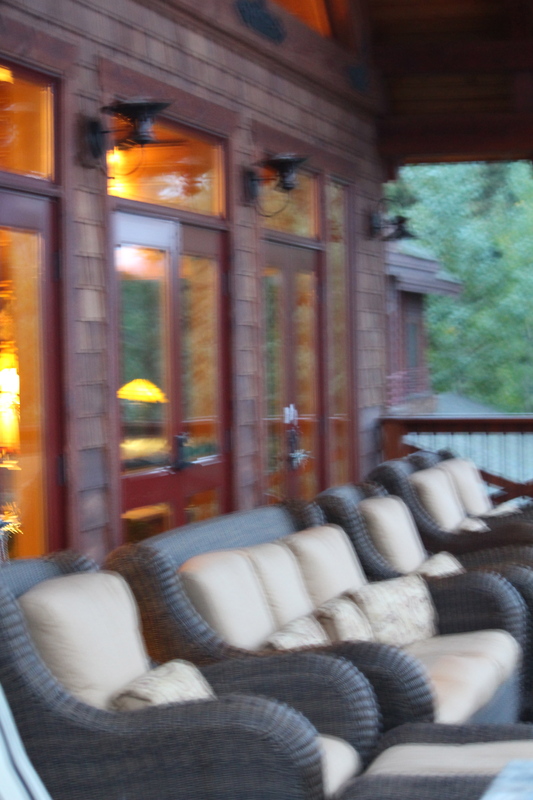 With gorgeous evening views of Lake Pend Oreille, though, our first priority was to relax in the cushy seats on the porch until the last glimmer of light dipped into the horizon. 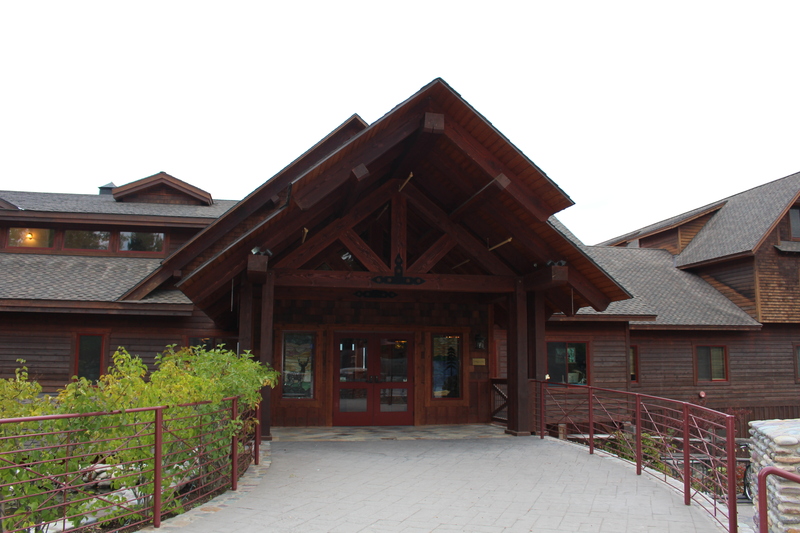 The Lodge at Sandpoint became one of the unexpected high points of our trip, and returning would be a plus, for sure. According to calendar listings in Sandpoint Magazine, special events abound. No matter what you enjoy doing — shopping, boating, rafting, fishing, celebrating — Sandpoint seemingly has it all. It’s definitely on our radar as a Place To See Again! For more on our travels in the Inland Northwest, click on the page at the top of this post. And we’d be very pleased if you click to follow this blog by email or share comments about any of the places you’ve visited in this beautiful part of America. This entry was posted in Bed & Breakfast Inns, Destination, Hotels, Idaho, Stay the Night, Travel and tagged Forty-One South, Idaho, Lake Pend Oreille, Lodge at Sandpoint, Sandpoint. Bookmark the permalink. I love to find out about these gems of places to stay on the blogs of others. I would never know otherwise. What a great place to stumble onto on your trip! It was definitely serendipitous and a great find. (But I don’t write about the ones that aren’t so great!!!) Thanks for stopping by and commenting. I love how you keep surprising me with nuggets from these trips! Lake “Pon-duh-ray” is one of my favorites! It’s cool to me that it was glacially-formed, which is why it is so darned deep. Sigh. Thanks, Rusha. Glad you enjoyed yourself! You know what? I didn’t know that lake was glacially formed. Wow! Thanks for telling me this. I really, really want to go back. We passed through downtown and saw a lot of interesting places. Then, when we read that magazine, we noted a lot of great things to do. So, it’s on the radar!!! 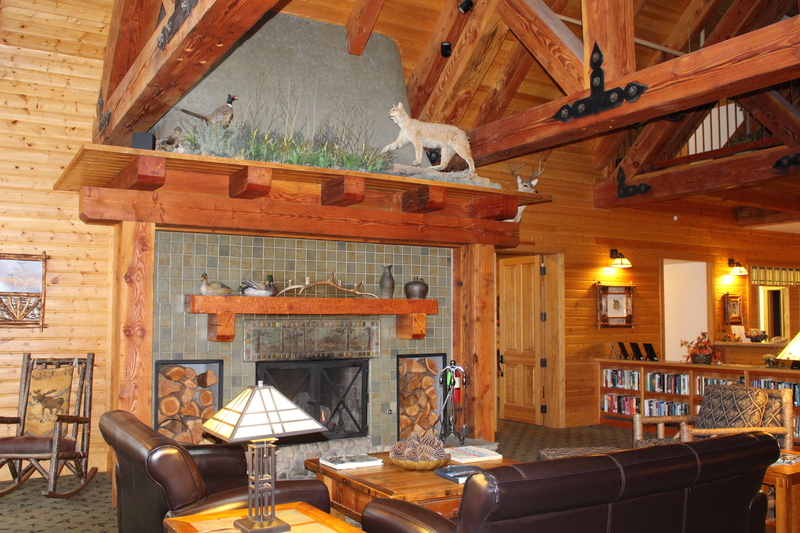 This lodge looks divine…what a splendid time to be here. Thanks for taking a look. I wish we had arrived earlier so we could get the full sunset. But we’ll know next time!